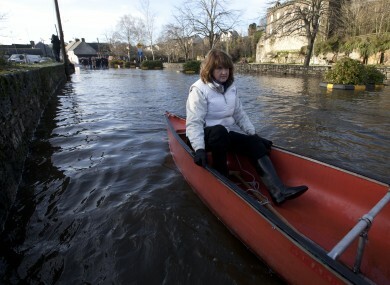 JOAN BURTON HAS said that many voters will not make up their mind until closer to election day as she reacted to a poll showing her in danger of losing her seat. Today’s Irish Independent carries a poll of her four-seat Dublin West constituency this morning and it shows the Labour leader in a distant fifth place. Reacting to the finding this morning, Burton noted that the poll is a smaller size sample than normal and “therefore the margin for error, I think, is over 4%”. “It indicates a very high number of undecided votes – of undecided voters,” she said. I have said repeatedly to yourselves and others that, in terms of this particular election, I don’t think a lot of people will make up their mind until very close to election day. Burton cited the result of the New Hampshire primaries in the US this week and the results of the British general election last year. The Irish Independent poll shows Burton with the support of 10% of voters. Leo Varadkar and Paul Donnelly lead the way on 20% for Fine Gael and Sinn Féin respectively. Jack Chambers and Ruth Coppinger are placed at 17% and 15% for Fianna Fáil and AAA-PBP. Those figures exclude the undecided voters who make up 14% of those polled. I’m told that I’m very transfer friendly. That’s something that I’ve been told before. She also pointed out that a lot of the media doubted the ability of the late Brian Lenihan to hold his seat for Fianna Fáil in Dublin West in the 2011 general election, before he was eventually elected. Burton has been elected five times in the constituency, first joining the Dáil in 1992 when she rode in on Labour’s sweeping gains that year. She lost her seat five years later but regained it in 2002 and has been a representative ever since. Email “'I'm told I'm very transfer friendly': Joan isn't too worried about that poll”. Feedback on “'I'm told I'm very transfer friendly': Joan isn't too worried about that poll”.